As the dry, warm days went on and on and on this winter, two guys intimate with California’s Sacramento San Joaquin River delta shifted gears. One reassigned staff from flood to drought response, and the other lay awake at night imagining barriers across various slough openings. 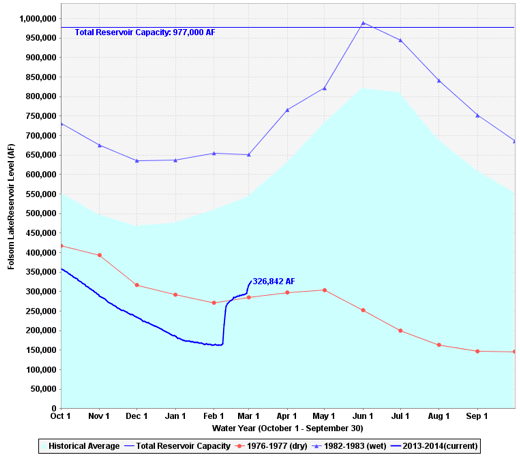 By early February, some Sierra reservoirs were so low, and so close to “dead pool” level, that the water projects stopped pumping and delivering. Farmers had to retrench, communities realized they might only have enough drinking water for the next six weeks, and any salmon that succeeded in spawning upstream had no water to carry them down. Things got scary. The water projects asked state regulators to let them off the hook in meeting various water quality standards, and the governor’s state of emergency put the Endangered Species Act on stand by. The water being spent, in this case, is fresh water released from Sierra reservoirs to repel saltwater intrusion from ocean tides into areas of the delta tapped by the water suppliers. In normal or wet years, this expenditure makes sense because the water that repels the salt field is also what makes estuaries biologically rich. But in extremely dry years, like we’re facing now, we have to think twice how we spend that scarce fresh water, says Burau. “If the drought is short lived, then spend it now. But if you’re looking at a protracted drought, you don’t want to spend water too early because if Sacramento River flow goes to zero, that’s very bad. Under some scenarios, if we don’t curtail reservoir releases, we’re going to be out of water for the ecosystem and for people by the end of the summer. So instead of burning through the water now, we may want to trickle it out later by making a few extraordinary alterations to the system,” he says. While Hinojosa’s group surveys the snowpack, with the help of a state wide network that produces a new forecast every month, Burau’s team tracks what little is left to trickle through the delta, and most of this monitoring is automated. 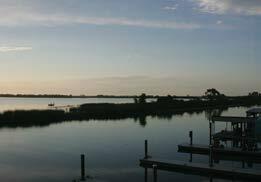 Indeed USGS maintains a network of 38 flow and water quality stations at every significant channel junction and river outlet in the delta, each equipped with state of the art sensors that also monitor salinity. Water managers rely on this network to tell them how many cubic feet per second (cfs) of fresh water is heading downstream, how much the tides are pushing this water around, and where the salt is. “This latest storm was a bump,” says Burau. Before the Pineapple Express arrived at the end of February, he was measuring flows at less than 6,000 cfs in the Sacramento River. After the storm came through they were up to 25,000 cfs, but that’s nothing like the typical peak flow of 60,000 cfs that usually occurs after a big winter storm. After this last storm, Burau also saw a bump in turbidity, but nothing like the first flush after a strong winter storm that can make the water look like chocolate. “Of course reservoirs are holding every drop from these last storms, so delta conditions will return to drought like within a couple of weeks unless we get more rain,” he says. Another thing that happens in dry years, when rivers are running so low, is that the tides, always the dominant hydrodynamic force in this estuary, have a much greater influence, as Burau found out on January 28, 2014. “We had really low Sacramento River flows, a king tide, and the delta cross channel gates were closed so the tides had nowhere else to go but up the river. These three things created super-reversing flows at our Freeport gauge, 5,000 cfs going upstream, something we’ve never measured before on the Sacramento River! We had to get crews out on the water to recalibrate all of our north delta stations,” he says. Measurements from the Freeport flow station near Sacramento also govern whether the regional sewage treatment plant can discharge wastewater, and they’re not allowed to discharge in reversing conditions. This winter was the first time the plant had to hold it’s effluent so often and for so long. “Imagine if you continuously released effluent into the water during reversing conditions, you would end up releasing into the same water several times,” says Burau. Typically the plant may have to “hold” for a few hours a year, but there were times this January and February when it had to hold for five hours a day. January’s constellation of near extreme events lit a fire under Burau’s thinking about the salt field. He met with an ad hoc group of equally concerned scientists, modelers and managers to come up with drought mitigation strategies that wouldn’t “burn” so much water to keep the salt field at bay. The first steps being explored would be to cut exports, open the cross channel gates and stop operating the Suisun Marsh salinity control gates further downstream – giving tides other places to go. “If we find ourselves back in extremely low flow conditions again, these would be the quickest, least expensive things we could do to save water that would also have the least impact on the ecosystem,” says Burau. All of these measures, says Burau, are aimed squarely at preventing one thing that seems to be the delta equivalent of a thermonuclear meltdown, at least for water managers: “losing control” of the salt field. Just mentioning it adds a wobble to Burau’s usually confident tone. The focal point for this potential meltdown is a 3,500 acre flooded island called Frank’s Tract. In sum, rather than letting the entire delta get salty as we slowly run out of water, concerned agencies and scientists have been exploring the pros and cons of a series a temporary barriers that would preferentially allow the north delta to get salty while maintaining what Burau calls a “fresh water corridor” through the central and south delta (see blue on map). Screen shot of a color–coded visualization of the estuary’s salt field on January 24-29, 2014. Linear interpolation of real time near-surface electrical conductivity data were used to generate this image from www.baydeltalive.com/salinity (see end of article). The cooler colors represent fresh water, the warmer colors salty water . Blue/green region is the approximate ‘fresh water corridor” discussed in article, and yellow is Frank’s Tract. The data used in this image were primarily collected by the USGS and DWR and retrieved from the Department of Water Resources’ California Data Exchange Center (CDEC). As he and his colleagues mull over and model these kinds of potential drought mitigation measures, Hinojosa’s agency hasn’t stopped worrying about another kind of emergency that could flood huge islands and change the hydrodynamics of the delta: levee failure. “When we lost Jones Tract, it was a nice spring day in June. So even though there was no high flood threat from river flows or from tidal action with these recent storms, there is always lingering concern that something could go wrong and you could lose a delta island with very little warning, or at least without any other precipitating event,” says Hinojosa. With weak levees, an unpredictable climate, and fast materializing implications of deeper droughts for the delta, it’s no wonder that the flexibility to reroute fresh water around delta hazards stays near the tops of many planners’ wish lists. That flexibility could come, some planners argue, from at last building the 21st century version of the peripheral canal – two twin tunnels taking water from a higher diversion point on the Sacramento River than we do currently, and away from the saltier perils of the central delta. As the state and stakeholders contemplate whether it’s worth the money, Burau sees conditions earlier this year as a clue: “This January, the water was really clear, the turbidity really low, and pumping was near zero, so the residence times of the water in the delta were long. In terms of ecosystem function, this period of unusually low pumping can give us a glimpse of what we might expect with the new tunnels – what things will look like when we don’t have the draw of water across the central delta to the pumps as we’ve had for decades now.” Without that draw, the water will remain in the delta longer. As residence times increase, the sediment in the water will settle, and sunlight will penetrate deeper. Such changes in conditions could make algal blooms more prevalent than they have been in the past. At that point, all of Burau’s work to study the tides and add salinity sensors to his flow stations, and his colleagues’ recent addition of new sensors that can track growing plant matter, may pay off even more. He envisions using these tools to pump water “preferentially.” “If you’re pumping hard you’re taking water from everywhere in the south delta, so taking water preferentially with the tides doesn’t work – pumping dominates south delta hydrodynamics. But in a drought, because we’re pumping so little, we can take water from where it is fresher, either at the end of a flood tide or the end of an ebb tide. This allows us to eke as much fresh water out of the system as we can under these extraordinary conditions, ” he says. As this issue went to press, Burau was running scenarios and Hinojosa was trying to take a day off with family in between days of being on call to monitor the state of the state’s freshwater supply: “When there’s less snow and less water, everyone wants to count every drop as soon as it lands. We’re all going to be very busy figuring out how to balance the system with the water we have, how to forecast into the future what needs might be and, every time it rains, how does it change the picture?” he says. Delta stakeholders will have easier access to real time data on conditions in the estuary through a new mapping environment called www.baydeltalive.com/salinity. 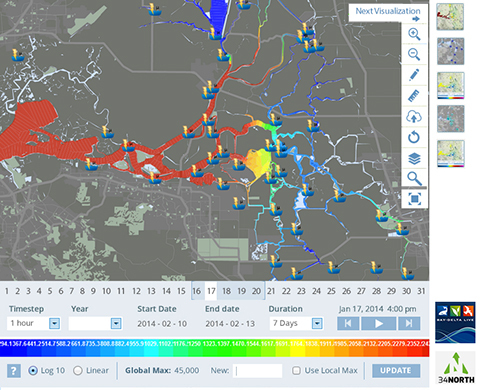 Based on the concept of a “common operating picture” or “dashboards,” users will have secure access to visualize, manage, and download data on real time conditions in the water, including turbidity, salinity, flows, delta hydrology, water project operations, X2, reservoir storage and releases, weather, fish salvage, tides, acoustic telemetry, and more. NEXT ARTICLE: Bay Primed for Pea Soup? Ariel Rubissow Okamoto is both today’s editor-in-chief and the founding editor of ESTUARY magazine (1992-2001). She enjoys writing in-depth, silo-crossing stories about water, restoration, and science. She’s a co-author of a Natural History of San Francisco Bay (UC Press 2011), frequent contributor of climate change stories to Bay Nature magazine, and occasional essayist for publications like the San Francisco Chronicle. In other lives, she has been a vintner, soccer mom, and waitress. She lives in San Francisco close to the Bay with her architect husband Paul Okamoto.